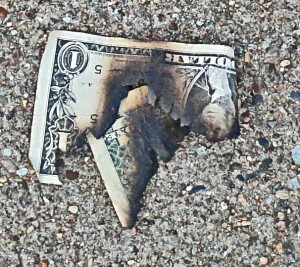 Yesterday, crossing the Slattery bridge over Boston’s Fairmount train line, I noticed this burned U.S. dollar on the sidewalk. Who knows the trivial tale here? While my first thought was that some young person was showing off lighting a blunt. Yet, as the bill seemed to have been lit in the middle, that’s not likely. Instead, perhaps someone who’d been drinking or was otherwise high decided it would be fun and funny to burn currency. Regardless, it brought me to a flashback to a post here five years ago. That deserves a reprise. Skipping pennies was and remains a teen amusement. Yet when I was in high school a dear friend a little older than my mother wove an entirely different tapestry and forever changed my mind. She was Evelyn Justice, my biscuit lady. We had known each other from my elementary-school days in Danville, Virginia. She worked for the dentist we used and became a family friend. She was surely the kindest and happiest person I have ever known. We were sad when she and her husband moved to Plainfield, New Jersey. Jump to high school and my mother moved us to that same city. There, I would walk across a broad park and a few more blocks to her house. She was a master biscuit maker (look and feel; no measuring) and glad to oblige me. One afternoon though, Evelyn was still upset from what she had experienced walking home. She had been just behind three guys from school — my school. 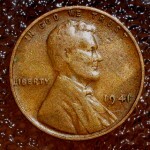 They gouged pennies from their jeans and with one in hand, they took turns skipping it along the sidewalk. She was aghast and transported to earlier times and distant places. She had grown up in a tiny town in the mountains of Western North Carolina. The region, including her family, was among the hardest of the hardscrabble during the Great Depression. Few had much and no one had anything to spare. To Evelyn, one U.S. cent, one one-hundredth of a dollar, was real money. A few pennies could make the difference of the family eating OK that week. Every cent was precious. The family coin jar was a shrine. In Plainfield, nearly four decades later, she was riven by the puerile pleasures of those young men. A penny by itself didn’t count for much to them, so little in fact that they could use them as disposable toys. Those guys did not share in family fears of want and deprivation. They did not save, remake, repair and conserve. She said that she followed behind them, picking up every penny they threw away. She didn’t care if they thought she was a crazy old lady. She knew what a cent had meant and still meant to her. She didn’t really need a palm of pennies, but she would be damned (a word she never would profane the air with herself) if she would let them literally throw away what had been so powerful to her. She asked me and I was able to say that I never engaged in skipping pennies. Yet when she asked I realized that it would not have been out of the question for me. I had never been presented with the activity. Plus, I had never been wasteful. I had earned money selling vegetables, being a paperboy, life-guarding, and on and on. I made my own money and quite literally did not throw it on the street. My mother said that she realized in college that she had been shielded from the Depression. Her father had a full-time job on the B&O Railroad for 48 years, including those when many were unemployed and hopeless. He also grew one or more one-acre vegetable and fruit gardens every summer for fresh and cannable food. He sold Chevys on the side. He also had a tailor shop and made clothes for the family. That led to a story my mother told on herself. She was always embarrassed to be wearing clothes her father made rather than store-bought dresses, skirts and blouses. She was short but long-waisted and could hardly wait to be fashionable when she was away from home. She rushed with her spending money to buy off the rack and was flabbergasted. Nothing fit. She had lived her life in tailored clothes! Even so, like many of the WWII generation, raised by those who navigated the Depression for their families, my mother carried that mindset. She taught us as she had been thought — respect objects, whether they be food, clothes or pennies. So in Plainfield, Evelyn had me tearing up with her. Her tales of how a few pennies might mean subsistence or the rarest of the rare, a treat, brought me beyond my frugality. In our nation of plenty, even in these hard times, we toss much, thinking nothing of what it means to those who have nothing or what it might have meant to other Americans. You’ll never catch me skipping pennies. That’s a lesson that went from Evelyn to me to my three sons and now to you.